The moon. What a subject it is. I cannot help but shoot it. Perhaps I take the phrase “shooting the moon” a bit too literally. At least I’m not trying to shoot it with a gun. I got up this morning and decided to see if the sunrise was interesting. I headed down the hall, back to the common area and onto the balcony. The wind was not any calmer than it had been two nights ago when I was waiting for the almost-full-moonrise that never showed. The temperature, however, was probably 20 degrees colder. I’d decided to do a little experiment. Instead of shooting with a wide-angle lens as I usually would, I decided to use my 70-200mm lens to see if I could get something a little different from the tried and true views of the riverfront. As the sun came up from behind the bluff, I waited to see if the light would get interesting in the sky. I was pretty focused (no pun intended) on the sun rising. Sometimes, I have to stop myself from staring because it gets hard to tell when the light has changed if you watch it too intensely. I guess it’s like living with someone who loses weight really gradually compared to running into someone you haven’t seen in ages who’s dropped 20 pounds since the last time you saw them. So, when I realized I was staring for too long, I decided it was time to look around and see what the rest of the view looked like. When I turned, there it was. 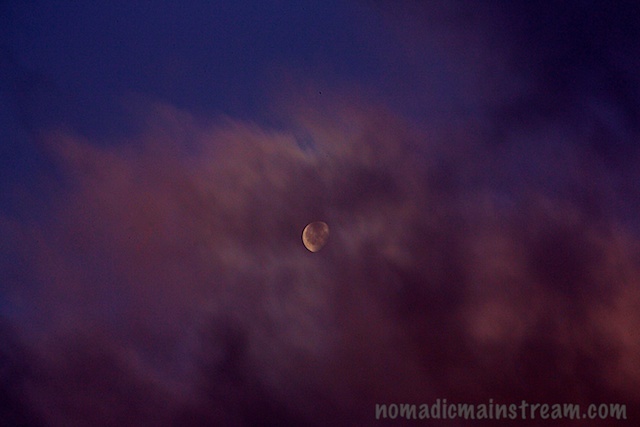 The lost moon, found again, centered in a clearing in the clouds. I swung my camera around on the tripod, zoomed in, and found focus just in time for the clouds to blow back over the *$%^ moon. Argh! But, with a few adjustments, I kind of liked the shot anyway. It was the only chance I got–the cloud coverage just kept getting thicker until there was just one small, bright spot in the clouds barely bright enough to be noticeable if I didn’t already know where the moon was. I turned back to the sunrise, but I kept looking over my shoulder just in case the moon decided to change its course and head back to the clearing. The moon made no such decision. Instead, it followed its predictable trajectory. At least, that’s what I assume it did–it’s not as if I could actually watch its progress. For all I know, it jumped out of the sky and will never be seen again. Just for kicks, I google the moonrise time for tonight. I don’t know if I have it in me to stand on the cold balcony waiting for the late rise of a waning gibbous moon–it’s just not as exciting as a full (or almost full) moon. I’m relieved to discover the moon won’t rise until after my bedtime. Maybe I should start shooting moonset? This entry was posted in Chattanooga, Photography and tagged Lunar photography, Moon, Shooting the moon. Bookmark the permalink.